Today I finally realized just how much smaller I am. As I stood in front of my class today to teach, I noticed that my pants were way, way more baggy than I’d previously noted. You know how when you wear pants, you’re not supposed to be able to feel the skin of your thighs touching, because really, your pants should fit such that your thighs clad in fabric are touching one another. Well, that was not the case for me, and it felt really odd. Then, I was walking around my classroom, teaching and observing the work my students were doing on the lab they were working on, and I kept having to hitch up my pants. This annoyed me to no end because I was trying to save my tummy from hanging out (these pants do not have belt loops, so I couldn’t wear a belt) and making an unnecessary appearance. That sealed the deal for me: it was time to finally buy new pants. I’d been holding off for a while, because I told myself that I would not buy new pants until I got down 2 sizes from what I started the school year as. I began school as a loose 28. Now I’m a just right 24, which is exciting in lots of ways because it now means I have so many more choices of places to buy clothes. But it also means that I’m at the size I told myself I’d buy new pants. So after I got home, greeted the sweetest husband in the world and lamented about my pants being too big, I declared that I was going to head out to find a couple of pairs of new pants. I was successful, and was able to land a few pairs of pants for work. Then I came home and ordered a couple of other pairs since I could not find the colors I wanted in the size I wanted. These will have to be hemmed up since they are about 3″ longer in the inseam than my short little legs are. Then I realized that I would need new jeans as well. This weekend I am boxing up a few pairs of my jeans to send to a woman in Oklahoma City who I found through one of the online support groups I belong to. She is celebrating getting down into my old size, and I let her know that I had several pairs of jeans in that size that I’d be willing to send her for cheap plus shipping. The money she’ll pay me for the jeans I’m sending her will pay for the jeans I just ordered from Levis.com for a killer price. They were having a sale, plus 25% off with a promo code AND free 2-day shipping if PayPal was used. So *this* girl saved about $45 on two pairs of Levis–my first ever. I could be in them by this Friday! I anticipate doing this with a lot of my larger clothing–selling it to others who may be on their way down through that size because they were larger and now need those sizes. I fully appreciate and understand the pain of having limited choices and am glad to help out where and when I can. But I need to make some money back so that I can continue to buy new clothes when I need them. I know a lot of people rely on thrift shopping to fill in the gaps as they move down sizes, but I am weird in that I don’t like clothes other people have already worn and sweated in. I don’t care that they’ve been washed or whatnot, I just don’t like wearing someone else’s clothes. The only other person whose clothes I have worn is my husband–he has a wonderful long sleeved t-shirt that I wear to sleep in, and that’s about it. It is also time for new bras. The bands are getting to be too loose, and they’ve been cutting into my side which is no bueno. Bras are something I can’t go without, because gravity is a cruel mistress and my girls are not perky (not that they ever were!). I might actually try one of the Spanx bras to see how they fit and feel. I do have a couple of bras that fit pretty well right now that are remnants of the last time I lost a lot of weight. They didn’t fit right back then, but they fit perfectly now. My stubbornness about buying new underthings is getting the best of me. But dammit, I’m going to hold off on buying new undies until they pretty much fall off, which they haven’t done so I’m safe there. The good thing about finally buying new pants is that I’ll be this size for a little bit and I can get away with wearing it for a little bit. Hopefully I won’t have to buy new pants again until February or so! Next on the list to resize: my wedding rings. I am going to have sizing beads put in to tighten them up until I am at goal, when I will have my rings completely resized. The tape I’m using right now to keep them from sliding around so much is not awesome looking and it is way more noticeable than I really want it to be. My surgeon was not kidding when he said that the first 6 months of weight loss are the most rapid. I didn’t anticipate it coming off as fast as it has, and I sure didn’t anticipate going down as many clothing sizes as I have so far. I’m starting to feel bones under my skin, and I’m wondering where my body will eventually settle. I’m anxious to see what the next few months bring, because the changes are very noticeable now–wonder what I will look like in January at my 6 month check up? Today’s protein: 84 grams. Not shabby at all. I don’t think I’ll buy the Oscar Meyer grilled chicken again though. I’ll stick to grilling my own and flavoring it how I like. Chicken shouldn’t have caramel color on it. But it was on sale so I decided, what the heck? 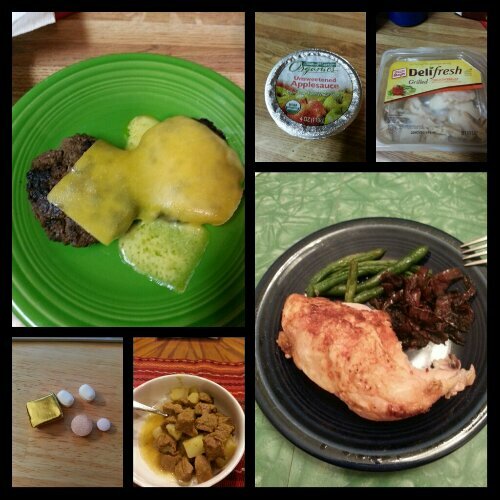 Today’s food choices, from upper right: Oscar Meyer deli cuts grilled chicken breast; baked chicken, caramelized onions and mashed potatoes (not shown); chile verde with beef and Jack cheese; multivitamin and calcium supplements x2, B12 and iron supplements; steakhouse slider patties (made with ground chuck) with a slice of sharp cheddar cheese; Central Market organic unsweetened applesauce. This entry was posted in big things, celebrations, daily bites, eating, economies of the scale, head trips, NSV's, post-op, success, vsg, weight loss surgery, werk! and tagged benefits of wls, clothes, economies of the scale, first Levi's, little celebrations, milestones, plus-size fashion, post-op eating, post-op life, VSG, vsg realness, WLS. Bookmark the permalink.